1920’s was the era of Jidaigeki in Japanese cinema. In spite of its popularity (or rather, because of it), only handful of the masterpieces of the era survived. Matsunosuke Onoe was the first Japanese cinema star and the most popular among kids during 1910’s and 20’s, but it was the late 20’s that saw the pinnacle of Jidaigeki. So I heard. In 1925, Daisuke Ito created “Chuji Tabi Nikki (忠治旅日記)” Trilogy with Denjiro Ohkochi, one of the most influential Jidaigeki in the Japanese cinema history. “Shin-ban Ooka Seidan (新版大岡政談, 1928, Dir. Daisuke Ito)”, “Zanzin Zanba Ken (斬人斬馬剣, 1929, Dir. Daisuke Ito)”, “Ronin Gai Trilogy (浪人街三部作, 1928-29, Dir. Masahiro Makino)” were considered the masterpieces of the day by whom ever saw them. Very few of these materials are available to us, many of which are in incomplete form. During this decade, the jidaigeki cinema underwent radical metamorphosis from heroic tale of fantasy to anti-heroic tragedy of doom. Accordingly, the faces of audience also changed. Boys under 10 years old packed theaters to catch new Matsunosuke Onoe, but later Daisuke Ito’s films won much broader audience base. As you can see, the action is stiffly choreographed, with an emphasis on “trick cinematography”. Jiraiya, the hero, can transforms himself into a giant toad, which just stun the enemies around. No wonder small kids loved them. Less than a decade later, it was a completely different game. 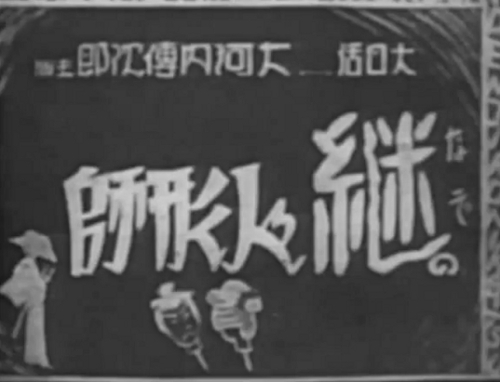 Here is the fragment of the lost film, “Nazo no Ningyoushi (謎の人形師, 1929 Dir. Seika Shiwa)”, with Denjiro Ohkochi going berserk. As I mentioned before, the shooting/projection speed was not consistent during this era, so look at this at a lower, more realistic speed. Still, he is going berserk. Not only the speed is incredible, but the camera movement is absolutely fabulous. And this is from one of the lesser films of the era.